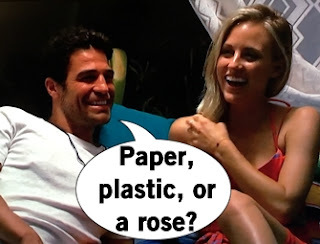 Bachelor in Paradise is back! The self-referential opening credits are of course back but the pacing seems off? Anyways, 9 women who dated Arie or Nick and 10 men who probably dated Becca (with a smidge of Rachel) arrive at Playa Escondida to find their new soulmate in about three weeks. The women have the elimination power this week and one man will go home at the first Rose Ceremony. Tia spends the entire first day in Paradise hoping Colton will walk down the steps; he's does not. Tia mopes there's no Colton and gets upset at receiving a date card, which a lot of these people might kill for (literally). She ends up taking Chris on a date because she likes his energy (over-styled Ben Stiller is an energy?) and they shared a passion for bold prints. Once Tia lets her walls down and puts Colton sort of out of her head, she has a good connection on the date with Chris and they kiss in front of a water show. Now smitten with Chris, it's the perfect time for Colton to enter mid-episode with a date card ready to rock the resort. After blowing off Tia and talking to other prospects first, everyone thinks Colton is shady and using Tia. Colton ends up taking Tia on his yachting and jetskiing date and they confront their "issues." The connection is back and they're smoochin'. But the guys back at the resort aren't ready to let Colton steamroll Tia and it. is. on. But like, on next week.